The average American internet user now spends an estimated 68 hours online per month, according to a recent report from Nielsen Company. The report also states that the average internet user visits 2700 sites per month, with an average of 57 seconds of viewing time per website. Staggering numbers! Scheduling your time online is a wise idea. Consider setting an alarm to go off after a long, gruelling session with your computer and get off the internet completely. Set a deadline for yourself and stick to it; do not give in to the temptation of staying any longer, or make excuses to remain in your chair. Give yourself ample time to finish all work tasks and walk away when that alarm sounds. Your body will thank you for it. If you feel like your entire world revolves online, you might want to consider picking up a hobby that isn’t related to the computer, internet, or technology. Go out with friends and family, play with your dog, or take a walk outside. Better yet, why not make sports or workingout a staple hobby! There’s no need to be chained to your laptop when there’s a whole world out there waiting for you to enjoy it. Take up knitting, or maybe reading – anything to get un-wired. Taking frequent breaks is key. Not only does it reduce stress, it also helps alleviate symptoms of CVS. 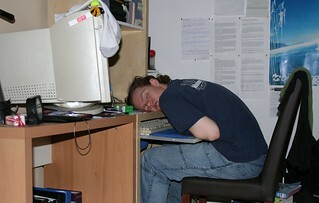 CVS, which stands for Computer Vision Syndrome, is the medically correct term for eyestrain related to spending too much time at your computer. Walk around the house, do some simple stretches, or grab a healthy snack. Remember that sitting in the same position for hours on end can lead to serious spinal or lumbar injury, and can be detrimental to your eyesight. Avoid the temptation to ingest excessive amounts of caffeine and sugar, no matter how much your body begs you for it when you feel your deadline looming before you. Whenever possible, print your work. This will rest your eyes and give them a chance to recover after staring too long at the intense glow of a computer screen. Computer use results in a decrease of blinking to almost one-third of normal, and blinking helps replenish the moisture in your eyes. This will begin to take its toll on your system after a while, resulting in a decrease in overall productivity. Reading your work in a hard copy form will alleviate these symptoms. Recycle paper if you can, though! Try to be good to the environment while being good to your body, too. Author Bio: George is a writer who occasionally does work for Eyeglasses4all.com prescription glasses and designersunglasses. He spends most of his day on the computer and has learned that sitting for hours can do more damage to your back than working a day in a construction site. The parts of body that are most affected by using access of internet and computer are eyes and brain,I also worked in front of computer daily 8 to 9 hours, and really some time when there is allot of work,some stress comes in my mind,Your tips are very precious gift for me to make my mind cool and fresh.